With the 2007 Geneva Motor Show looming large on the horizon we thought it might be instructive to look back at a concept from 39 years ago, crafted by Giovanni Michelotti and built on a DAF 55 chassis. 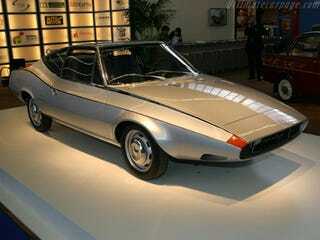 It's the Siluro, named after a self-propelled underwater munition and held onto by Michelotti until his 1980 death. It languished for years in his son's garden, a rotting monument to the awesomeness of rubber-band drive combined with fine Italian styling. Thankfully, the heads at the DAF Museum tracked it down and the car underwent a painstaking rehabilitation. Yay Michelotti! Yay DAF!